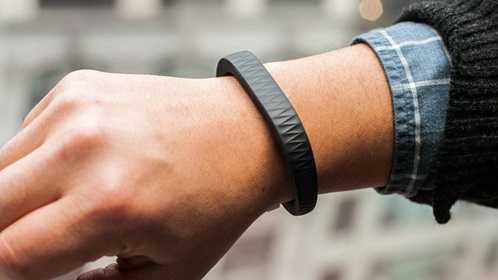 This review will tell you about UP by Jawbone. The features will be highlighted as well as where you can get the best deal for your money. This should help you find the best fitness tracker for you. With UP by Jawbone you are getting more than just a fitness/activity tracker, you are getting a whole fitness system to help you get on track and stay on track. By Pairing UP by Jawbone with the free mobile app you can track all your activity, awake and sleeping along with what you are consuming everyday. Allowing you an accurate picture of where you are and allowing you to set goals and plans to get where you want to be. UP by Jawbone’s mobile app makes it very simple to track. Download the data from Up to the mobile app to track your activity and log what you eat and drink daily, you can be as general or detailed as your time allows. UP helps you track calories, fats, carbohydrates, protein, sugar, fiber and sodium. The UP by Jawbone wristband comes in 5 colors and 3 sizes so you are sure to find the size and style that best fits your personality. Speaking of personality, the UP app gives you personalized tips and insights that allow you to meet your fitness goals. One very unique feature of UP by Jawbone is the available alarms and reminders. You can program an alert that will let you know when you have been idle too long and remind you to move and also set a silent alarm that will silently wake you without disturbing your partner. Up by Jawbone along with the accompanying App is a wonderful interactive system that allows you full control over your activity and dietary goals by tracking key information needed to make sound decisions and set proper goals for weight loss and fitness. With its 10 day battery life it has the power to keep up with even the most active lifestyle. I started using the Jawbone up three weeks ago. It has been a great tool in the battle of the bulge! It is not always easy to keep track of you food intake vs exercise. I found while using the up, I had a much better sense of the amount of exercise needed to burn the calories I am taking in. I’ll be the first to point out I’m lazy and I procrastinate. I got the UP band because of the Smart Alarm feature. Who doesn’t want to wake up in the right time of the sleep cycle rather hitting the snooze button to get just 5 more minutes? The procrastinator in me used to do this oh…until I left myself about 20 minutes to get my dog walked and myself ready to hit the door. UP makes it incredibly EASY to know and do better! Easy = Awesome for us lazy folks. The app shows you how many steps you’ve taken. Doh! Haven’t hit your goal? Start walking! Even if its to your favorite bakery to get a cookie, just start walking. While we’re on the subject of cookies, the app makes food choices easy too. Logging your food = knowing what you’ve eaten! Shock and gasps, I know! You know you want that cookie, so eat the dang cookie!! Just pay attention when that genius app shows you what you can go crazy on, where you need to pay attention and what you should pass on. This little wristband is easy to wear, unobstrusive, and a great motivator. It has great graphics to view your progress. I especially like that it records your sleep.